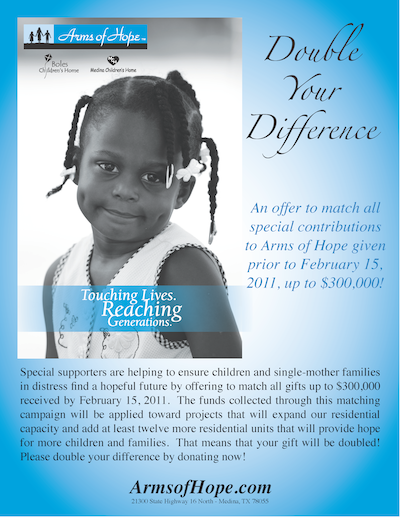 An offer to match all special contributions to Arms of Hope given prior to February 15, 2011, up to $300,000! Special supporters are helping to ensure children and single-mother families in distress find a hopeful future by offering to match all gifts up to $300,000 received by February 15, 2011. The funds collected through this matching campaign will be applied towards projects that will expand our residential capacity and add at least twelve more residential units that will provide hope for more children and familes. That means that your gift will be doubled! Please double your difference by donating now! For more information click here or on the image below to download the Double Your Difference PDF.